From a first-principles perspective, the task of feeding 8 billion people boils down to converting energy from the sun into chemical energy in our bodies. Traditionally, solar energy is converted by photosynthesis into carbohydrates in plants (i.e. biomass), which is either eaten by the vegans amongst us, or fed to animals, for those who with a carnivorous preference. Today the process of feeding humanity is extremely inefficient. The average American meal travels over 1,500 miles from farm to table. Wine from France, beef from Texas, potatoes from Idaho, etc. As a result, nearly half the cost of today’s meals is the travel cost. Imagine instead, growing all of your food, in a 50-story tall vertical farm in down-town LA, or off-shore on the Great Lakes where the travel distance is no longer 1,500 miles, but 50 miles. Perhaps more importantly, vertical farming also allows tomorrow’s farmer the ability to control the exact conditions 24x7 of her plants. Yet another application is our ability to make plants resistant to infection, or more resistant to drought or cold. Helping to accelerate the impact of CRISPR, the USDA recently announced that genetically engineered crops will not be regulated -- providing an opening for entrepreneurs to capitalize on the opportunities for optimization CRISPR enables. Fully 33% of the Earth’s non-ice landmass is used for raising livestock -- a massive amount of land -- and global demand for meat is predicted to double in the coming decade. Today, we must grow an entire cow -- all bones, skin and internals included -- to produce a steak. Imagine instead, if we could start with a single muscle stem cell and only grow the steak, without needing the rest of the cow? Think of it as cellular agriculture. Imagine returning millions, perhaps billions of acres of grazing land back to the wilderness? This is the promise of Lab Grown Meets. Lab-grown meat can also be engineered (using technology like CRISPR) to be packed with nutrients, and be the healthiest, most delicious protein possible. JUST, Inc. (previously Hampton Creek) run by my friend Josh Tetrick, has been on a mission to build a food system where everyone can get and afford delicious, nutritious food. They started by exploring 300,000+ species of plants all around the world to see how they can make food better, and now are investing heavily in stem-cell grown meats. Backed by Richard Branson and Bill Gates, Memphis Meats is working on ways to produce real meat from animal cells, rather than whole animals. So far, they have produced beef, chicken and duck using cultured cells from living animals. Farmers 0.0 (Around 9000 BCE, Neolithic Revolution): The hunter-gatherer to agriculture transition gains momentum, and man cultivated the ability to domesticate plants for food production. Farmers 1.0 (until circa 19th century): Farmers spent all day in the field performing backbreaking labor, and agriculture made up 82 percent of U.S. jobs. Farmers 2.0 (mid 20th century, Green Revolution): From the invention of the first farm tractor in 1812 through today, transformative mechanical biochemical technologies (fertilizer) boosted yields and made the job of farming easier, driving the U.S. farm job rate down to less than 2 percent today. Farmers 3.0: In the near future, farmers will leverage exponential technologies (e.g. AI, networks, sensors, robotics, drones), CRISPR and genetic engineering, and new business models to solve the world’s greatest food challenges and efficiently feed the 8-billion-plus people on Earth. Ten farm-in-a-shipping-containers in a Brooklyn parking lot represent the first Square Roots campus. Each 8 ft x 8.5 ft x 20 ft shipping container contains an equivalent of 2 acres of produce and can yield more than 50 lbs of produce each week. One of our MTP’s at the Abundance Group is to empower entrepreneurs to generate extraordinary wealth while creating a world of abundance. Vertical farms and cellular agriculture are key elements enabling the next generation of food and agriculture entrepreneurs. 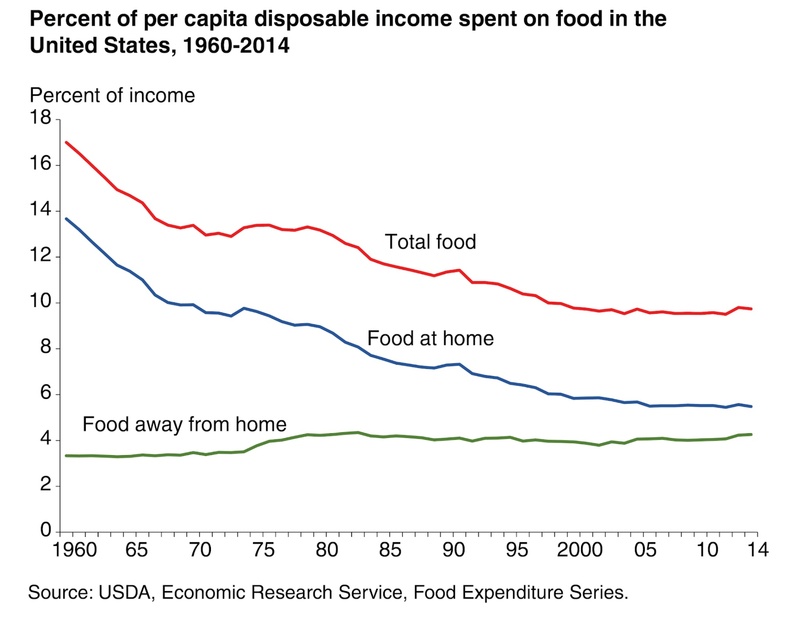 From 1960 to 2014, the percent of income spent on food in the U.S. fell from 19 percent to under 10 percent of total disposable income -- a dramatic decrease over the 40 percent of household income spent on food in 1900. Ultimately, technology has enabled a massive variety of food, at a significantly reduced cost, and with fewer resources used for production. And that means a world with abundant, nutritious and inexpensive food for every man, woman and child.